DEATHS. March 18th. at North-street, St. Leonards, Mary Ann. wife Mr. Charles Chapman, dairyman,after a prolonged illness, aged 41 years. OUR PORTRAIT GALLERY. THE NEW TOWN COUNCILLOR. MR. CHAS. CHAPMAN. FOUR GENERATIONS OF MILKMEN. Under the above headings the following interesting article appeared a day or two ago in our contemporary the Journal, the accession to its numbers of Mr. Charles Chapman, the Hastings Town Council has gained a man of much force of character, who will be an acquisition to tbat body. There are not many men in the borough at all like Cllr. Chapman, perhaps none. As he occupies a distinctive position, and is so well-known and widely respected, and also by reason of the fact that he has just become a member of the Corporation, we have chosen him as the first in a series of public men whom it is our intention to introduce the public through the columns of The Journal. Really, however, in this c»se at any rate, no introduction is necessary, for the subject of our sketch is so well known to all, and has so long been a "prominent man." " Charlie "… has taken an active part in the debates of that body during the eleven years he has sat at Cackle-street, and made himself one of the most prominent of the representatives of the ratepayers. He is 53 YEARS Of AGE, his father and grandfather both being milkmen, as also is his son. His education was rather neglected, for he had to begin work for part of the day when only eight or nine years old, and when only ten, was required every morning to get up at four and go from his home in North Street to the Harrow to fetch cream, and then return with it to Gensing Farm, where Pevensey-road is now. Most of his education was derived at the St. Leonards Mechanical Institute, the value of which he heartily recognises. 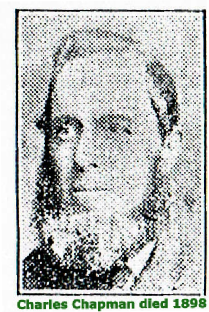 Mr. Chapman, who was the second of 13 children, has been married twice, and has two sons and a daughter. He is a Wesleyan, and attends the Norman road Chapel. The new Councillor is a Director of the Cottage Investment Building Society, and a Director of the Working Men's Mutual Loan Society. The profoundest sympathy will be felt for Mr Charles Chapman, not only by his supporters in the late election and by the many admirers of his sterling, blunt character amongst the townspeople generally, but by those who felt their duty to oppose him in the recent Municipa campaign. It was generally known that he took the opposition to his return to the Council very much to heart, and it was even said that in the event of his defeat he would disappear altogether. 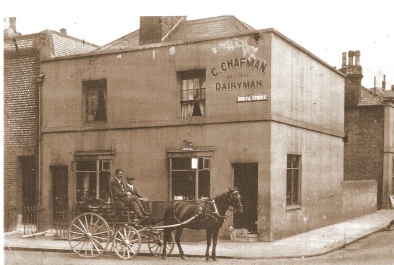 In the Hastings and St Leonards Observer is an account of Charles Chapman being summoned in respect to polluted well at 23, North-street, St. Leonards, —Defendant said he had lived there all his life, and personally did not think there was anything the matter with it. —An order was made for the well to be closed in a month. Mr. Chapman :It won't kill me during the month, will it, as my life is insured ?